Primitive Hand Lettered Everyday Mini Word Plate with Stars. Our series of mini word plates are a great say to say a lot in a little way. This plate design is great for year round display. Features burgundy stars stenciled in the background and you can choose whichever saying suits you best. 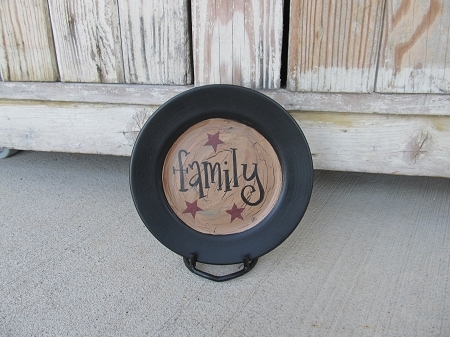 The rim color on this one is black and the saying is Family. Average size is around 5"-6". Hand painted, designed and signed by Heidi.